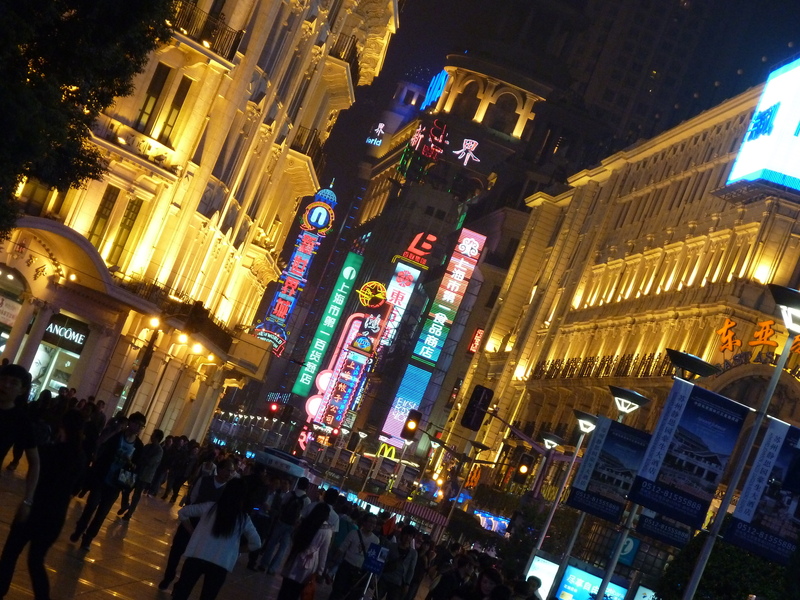 It was 3am on the day I was travelling to Shanghai when I finally got into bed, having had just a couple of drinks in a packed Beijing nightclub called Vics. 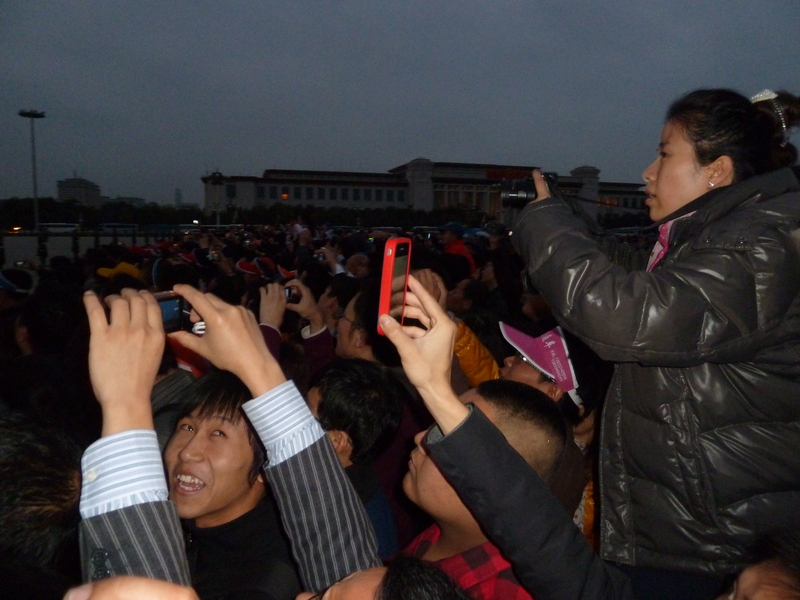 Three hours later, I was getting up again to watch the raising of the flag ceremony in Tiananmen Square. It was something that I’d seen on signs around the square, monitored by police and soldiers, and takes place twice a day, at sunrise and sunset. 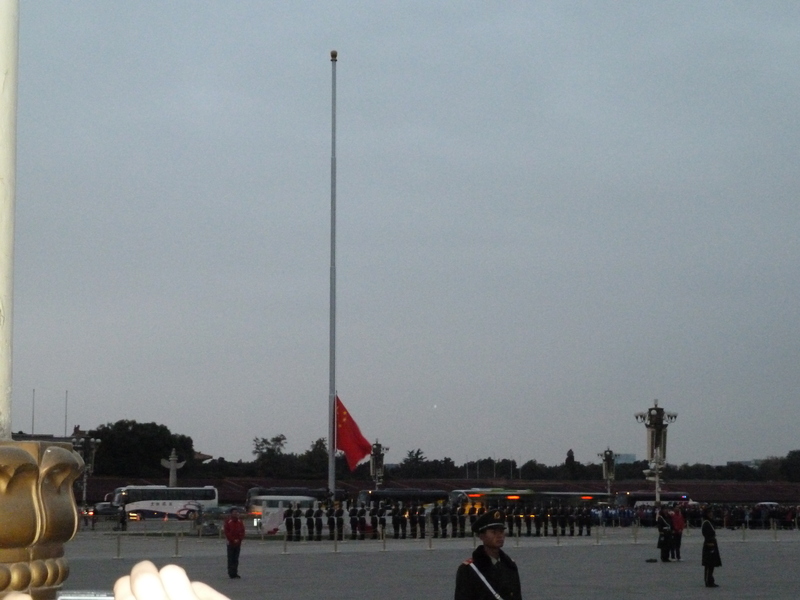 There’s lots of soldiers marching around, music, the flag of China being hoisted up the huge flagpole opposite Mao’s portrait, that kind of thing. 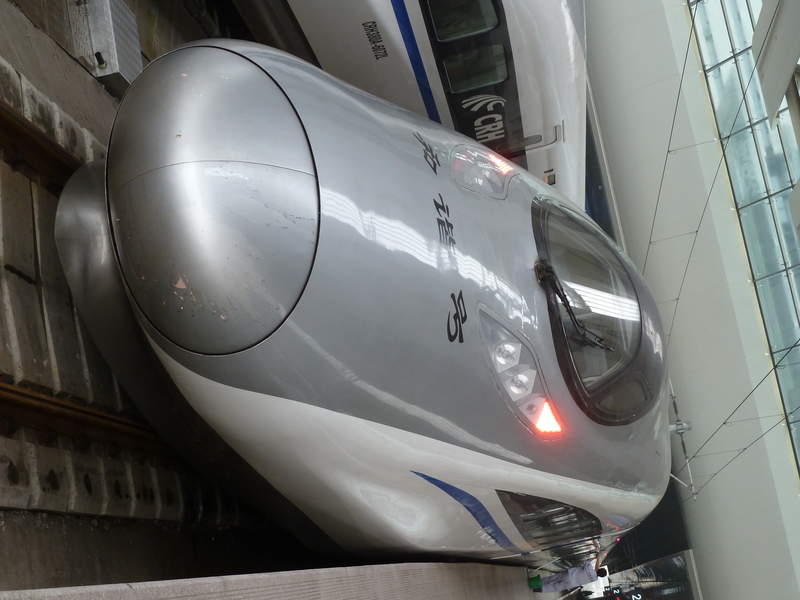 I’d tried – and failed – to wake up early enough on two previous occasions, but this was my last chance as my train to Shanghai left Beijing’s South Station at 10am. “You’ll never do it. Its crazy,” Santi said to me as we headed to bed just a few hours ago. Somehow, despite a slight hangover, I made it, and walked along with the Chinese public through Tiananmen Square to go and watch this most patriotic of ceremonies. Despite the early hour, there were hundreds, if not thousands of people there, all wanting their glimpse of the flag being raised. At precisely 6.45am, the national anthem began, everyone jostled for a look, and at precisely the moment the flag reached the top of the pole, the anthem came to a natural end. It was perfect timing – and obviously very well rehearsed. And that was it – a few soldiers did a little march, but everyone was too busy heading to their flag-waving tour leader, and no doubt on to their buses, for a day of sightseeing. I headed back to bed for an hour, wondering if it was really worth the effort getting up – it hardly gave our Changing of the Guard ceremony a run for its money! Thankfully, I didn’t sleep through my re-set alarm, stuffed the last of my belongings into my bag and put my jacket on. I had to say goodbye to Santi and Gali here, which was a real shame as we’d become good mates, even despite the fact Gali and I could only have decent conversations through Santi acting as an interpreter! We first met in Russia, at the backpackers in Irkutsk, so we’d spent the best part of two weeks together, with a few other people along the way. It just so happened our itineraries matched, so we ended up hanging out and booking hostels together. Sadly, they don’t leave for Shanghai for another few days. We’d had some brilliant laughs together though, and I’d like to think we’ll stay in touch. Now, I was on my own again, for the first time since Russia which was already seeming like quite some time ago. Laden down with all my bags yet again, I headed to the incredibly modern Beijing South Station, to get onboard an even more modern Bullet train to Shanghai. Everything is set out like an airport. 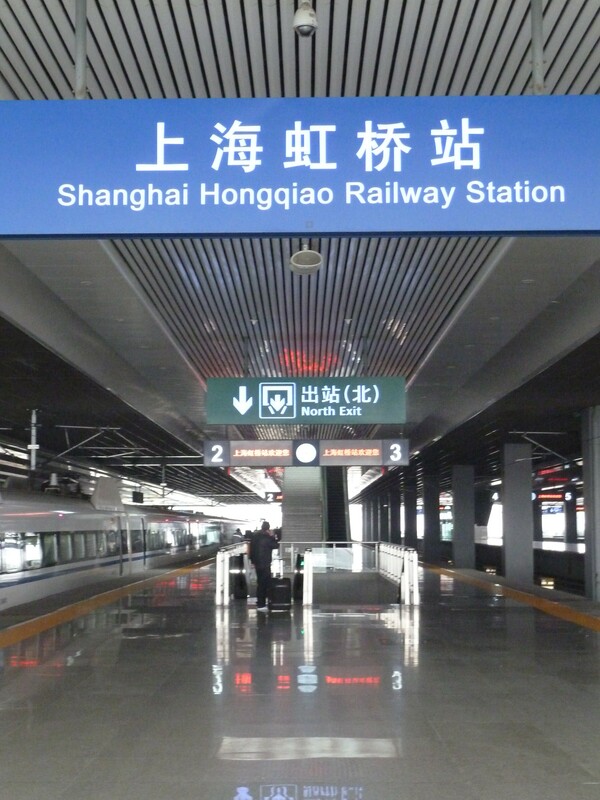 Infact, you don’t see any trains as they are all beneath you, and with the huge futuristic station, incredibly high ceiling, gigantic electronic destination board and the fact you have to ‘check in’ with your rail ticket, it does feel more like you’re at an airport than Beijing’s equivalent of King’s Cross. But if I thought the station was impressive, the actual train was like something from the future. 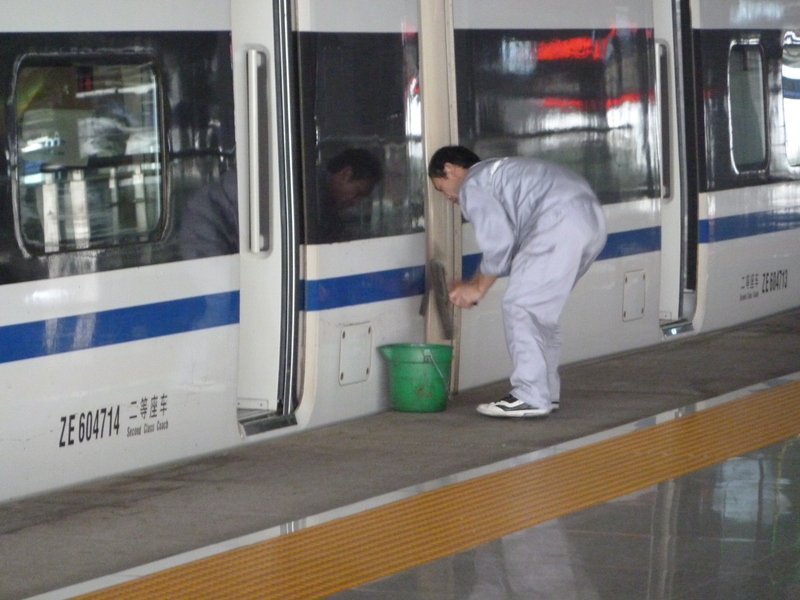 A long, streamlined, pointed nose stretches out, while the immaculately white and spotlessly clean carriages are constantly being polished by an army of cleaners. Whether it helps with its top speed, I’m not entirely sure – but at least you could see out of the windows. 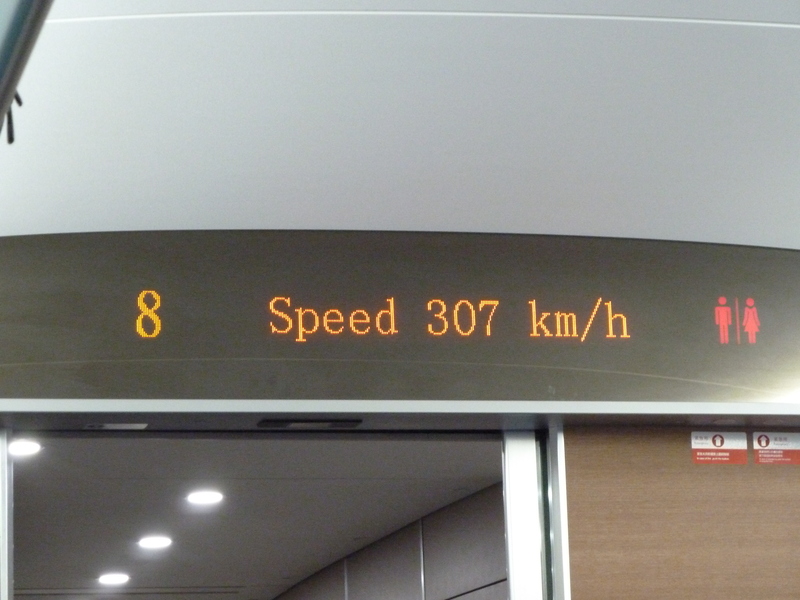 As it whizzed up to its top speed of 307km/hr, the world started rushing past the window. 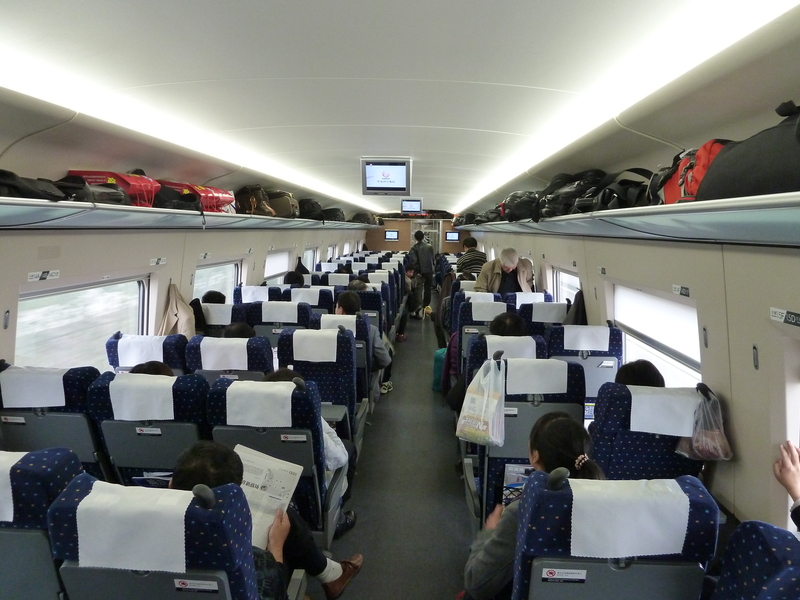 It was spectacularly quick and very comfortable – a long, long way from the trans-Siberian trains I had spent so many days on. I fell asleep for a few hours thanks to the early start and late night, but thankfully my headache had started to go away. 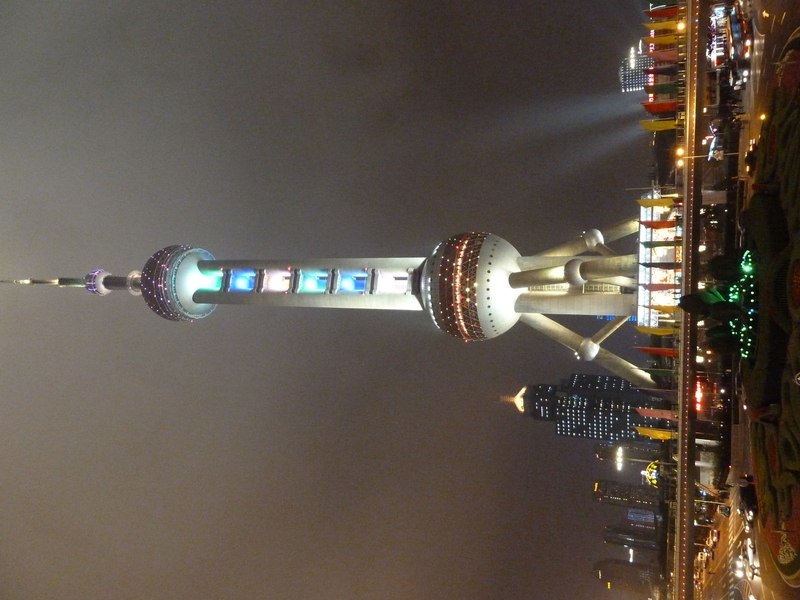 In less than five hours – 4hrs 48mins to be precise – we had covered more than 800 miles between the two cities and pulled into Shanghai. To put that into some kind of perspective, it’s the equivalent of travelling from Cornwall to the top of Scotland in less than five hours. Amazing. While on the train, I’d been looking at the calendar. I’d worked out that with a clever bit of fast sightseeing in Shanghai, I had just enough time for a stop in Xi’An, home of the Terracotta Warriors, if flight schedules and prices were kind to me. I found the hostel quite easily thanks to some much better directions from the website, and it was quite some hostel. 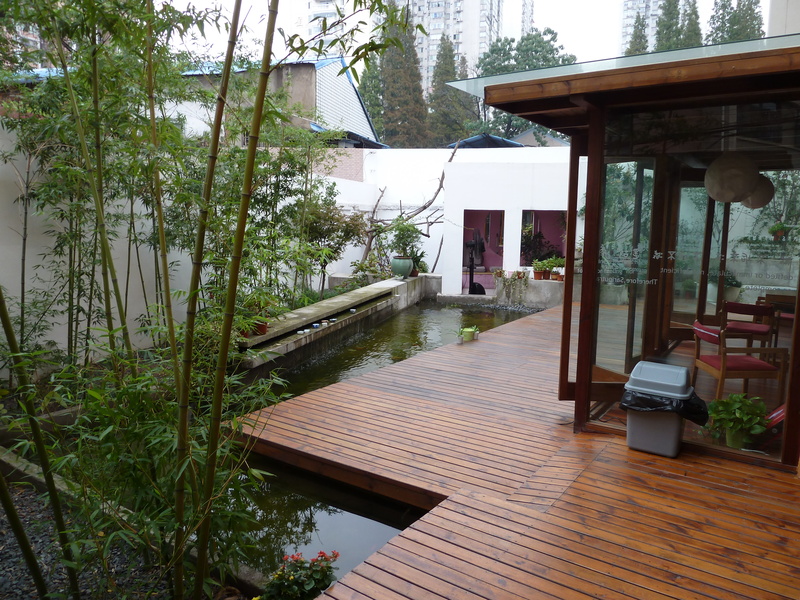 The Rock and Wood in Shanghai is classed as the number one ‘alternative’ accommodation in the city on Tripadvisor, and it was easy to see why – fabulous fish-filled pond, decking, floor to ceiling windows onto the terrace, free pool, cheap bar, excellent rooms. It was more like an upmarket hotel – and it was just £5 a night! When it was all dried, I went out to explore and headed to the Bund, the main waterfront area where you can see the famous skyline. 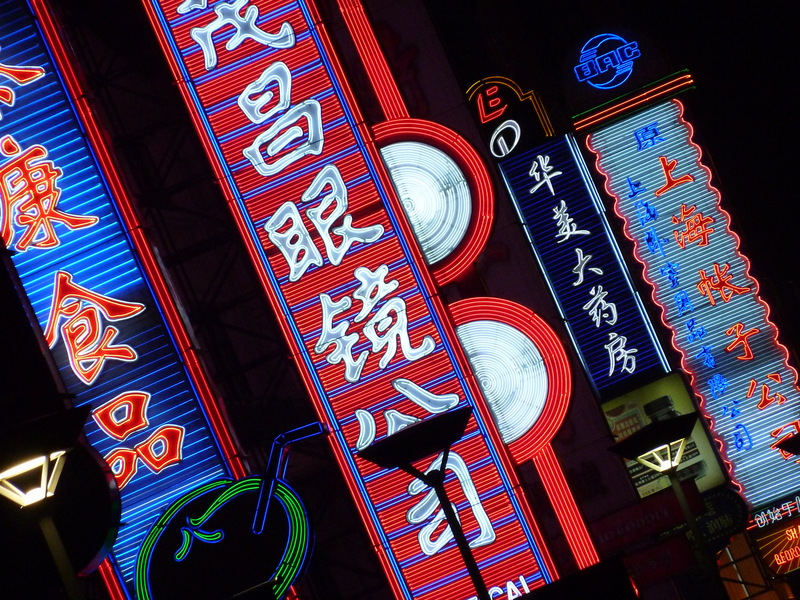 My journey took me along the main shopping street in the city, but it was lit up with so much neon it put Piccadilly Circus to shame. 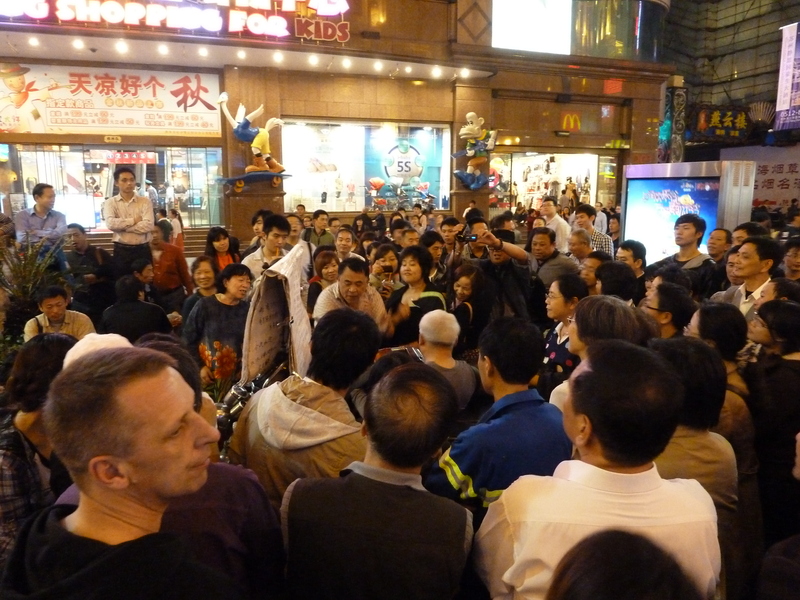 There were street entertainers everywhere, music, groups of Chinese people singing to some crazy man acting as a conductor, and street hawkers trying to sell you absolutely anything. On the mile or so walk, I was offered dozens of annoying lit-up helicopter things that are constantly floating down to the ground, noisy pebbles, spinning tops, laser pens, kites, roller wheels for my shoes, some funny glasses, a dog (real), various massages, some authentic Chinese tea (not again!) about three ‘beautiful women’ and one ‘gorgeous guy’. I declined all the offers. I eventually beat off the sales pitches and made it to the waterfront, where there were hundreds of people relaxing and taking in the view. Low cloud was getting in the way, but it was still a great sight. I stayed until 11pm when I decided to make my way back to the underground station, only to find out the last train had already gone. It was a really early finish for one of the leading cities in the world, so a taxi it was. Next day was the busy day with a plan to walk around the sights from People’s Square, but that’s where I did fall for a sales pitch. The open top sightseeing bus was only £3 for the day, and I knew it would give my legs a rest. 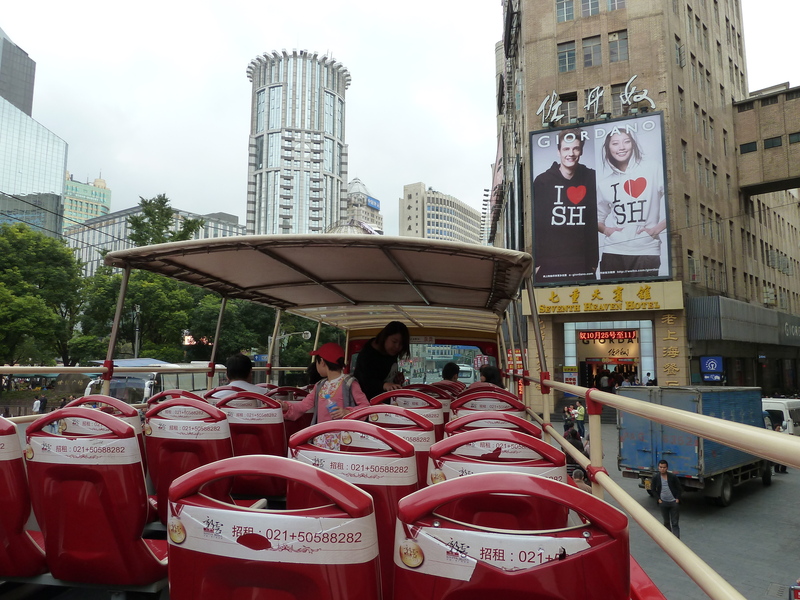 The sights were taken in by two routes on the bus, one that did a loop around Shanghai’s older areas, while another went under a tunnel to the newer financial district and all its skyscrapers. 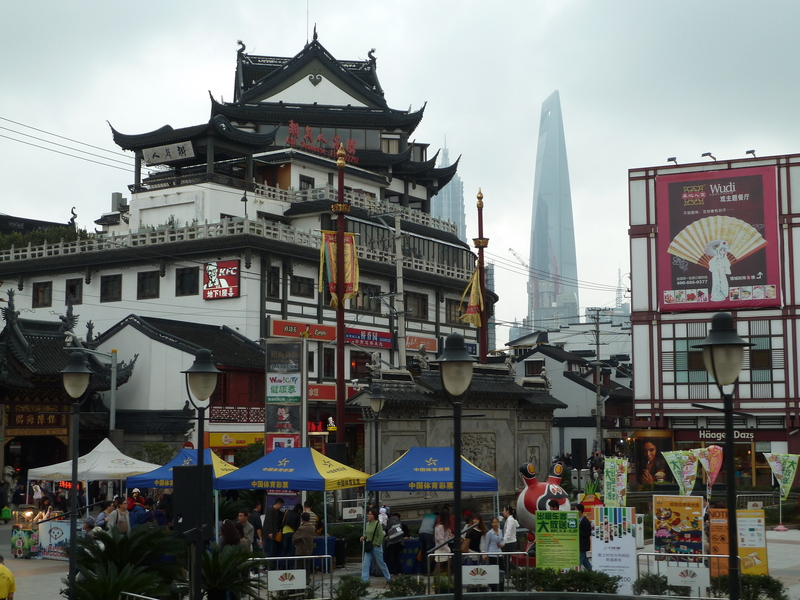 It was nice to sit for a few hours and take in all the sights, both of old Shanghai and around the modern day city, one of the biggest financial centres in the world. 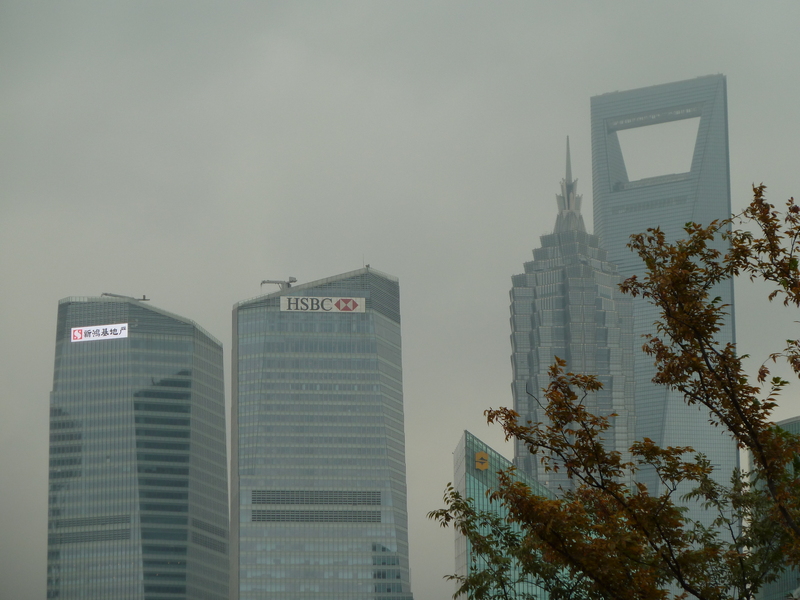 It included what was until recently the tallest building in the world, the Shanghai World Financial Centre, a peculiar building that rises above all the others, sticking up with a huge opening at the top like some sort of giant bottle opener. 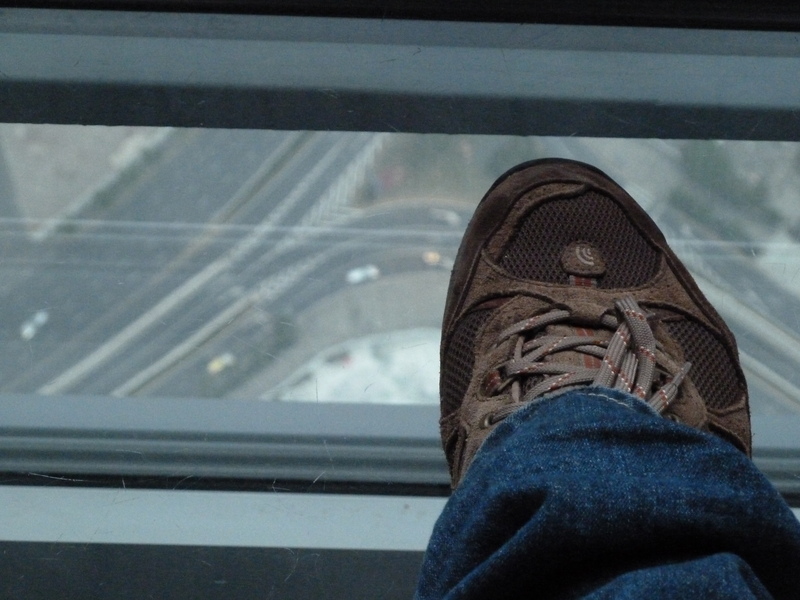 I’d timed it to see the view in daylight, and then hung around looking through the glass floor and trying to pick out landmarks until it got dark, and then took some night shots too. 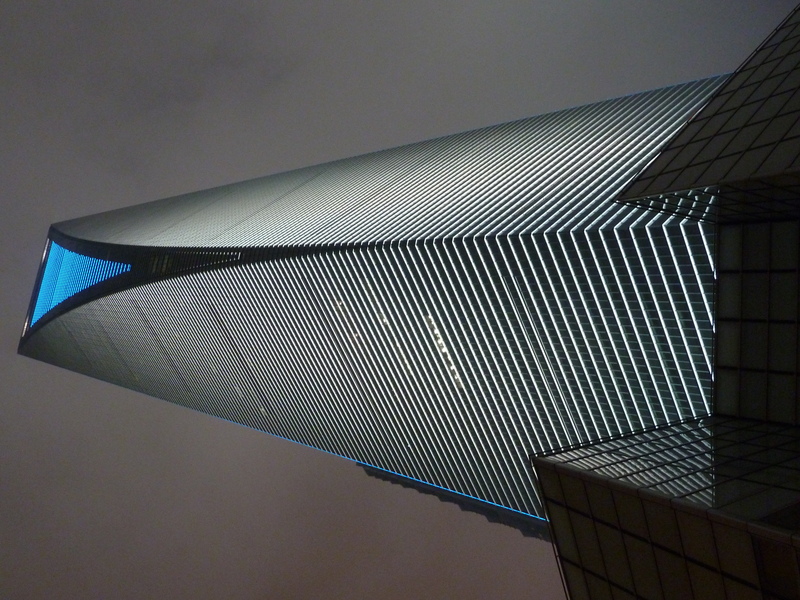 I also did a bit of research, and found out that all the signs and posters everywhere were now wrong, as a new skyscraper in Dubai has knocked the Shanghai tower off its perch as highest observatory too. They were quite proud of their record here though, so I didn’t have the heart to break the news to them! 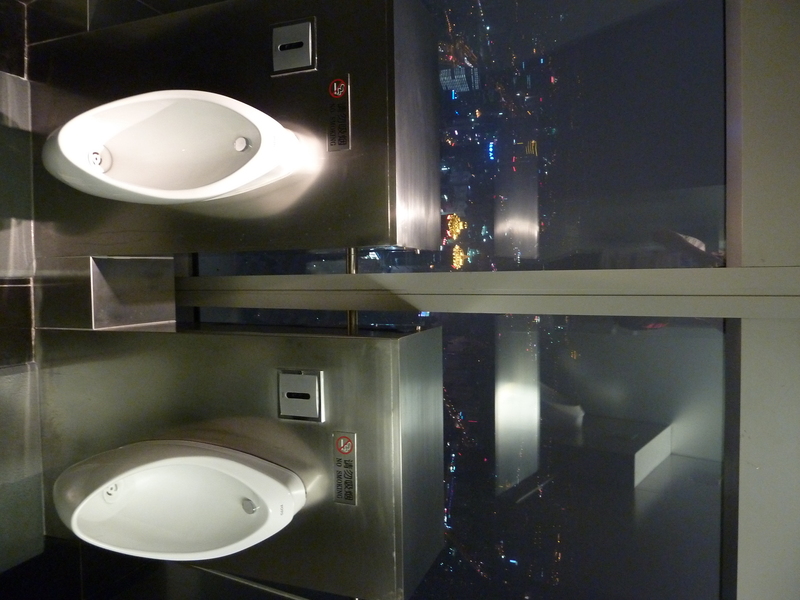 I went down in the high-speed lift to the bottom and walked to something dubiously called the Bund Tourist Tunnel. It cost a fiver to go through, and you get bunged into a funny monorail type thing and travel under the river to the Bund. You pass through all sorts of psychedelic lights and effects, and it was all a bit weird. Some inflatable people fluttered against the windows at one point. 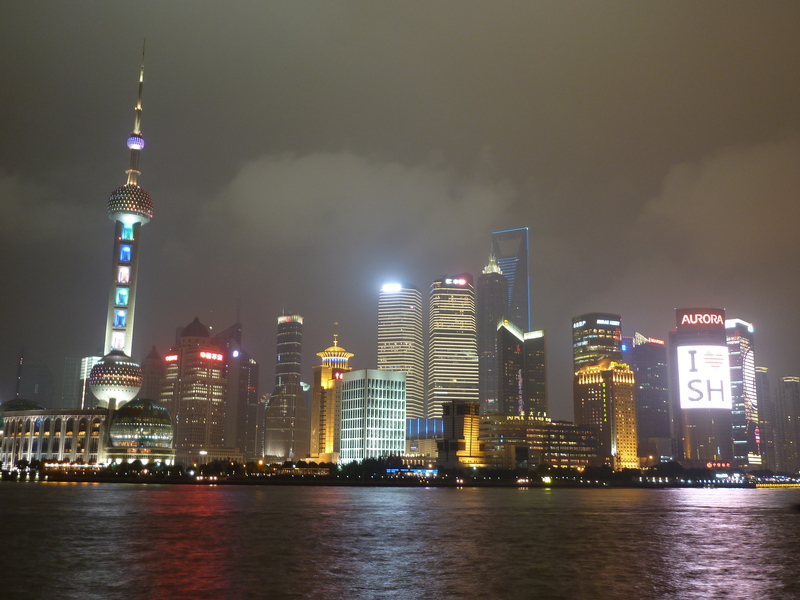 I was really taken by Shanghai though – its very much got a big city feel about it. I was quite gutted to have to leave after just a couple of days. 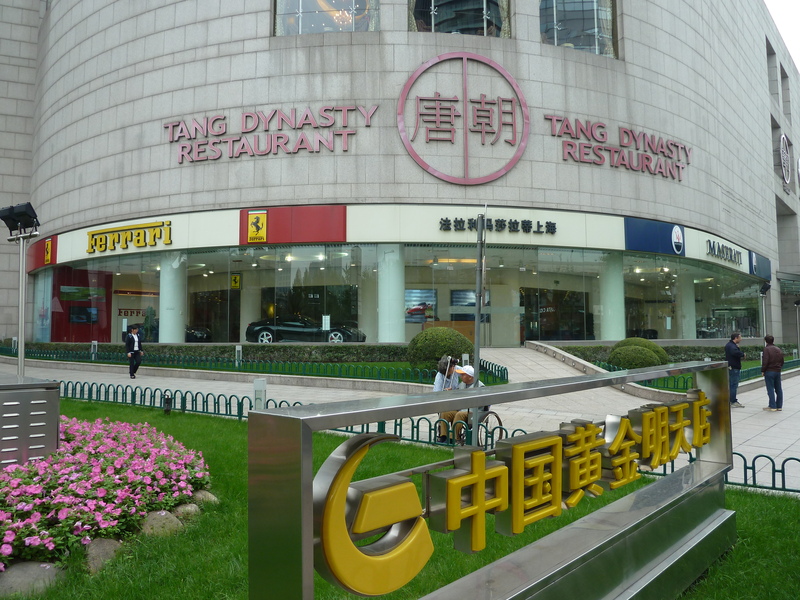 It gets dubbed the ‘Paris of the East’ by tour guides. Well, ive already been to the ‘Paris of Siberia’ in Irkutsk, so ive decided its more of a ‘New York of the Orient’. The tall skyscrapers and busy nature of the city, combined with its old architecture and ‘new living alongside old’ is something I’d definitely go back and visit. That night, I found a cheapish flight to Xi An and a flight from Xi An to Bangkok in a couple of days. 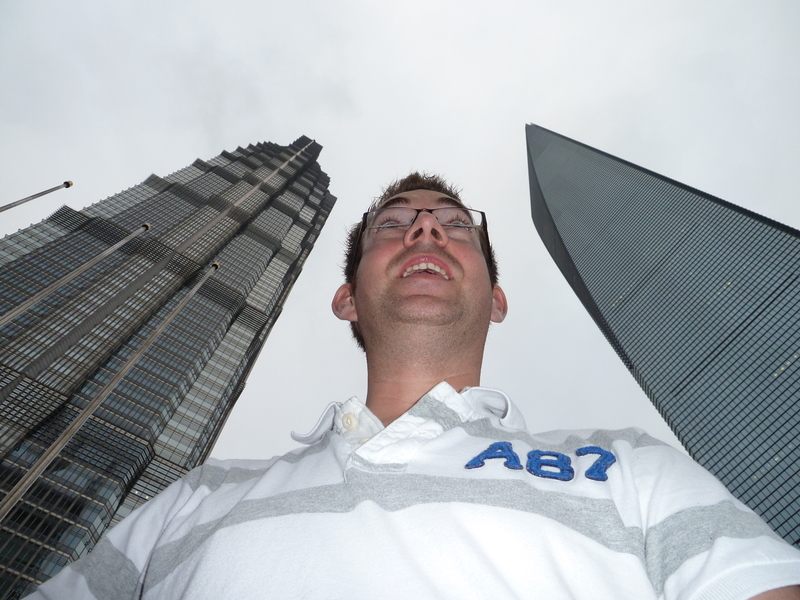 My plan had come together – I was able to fit in a bonus trip to one of the other famous architectural sights in China. 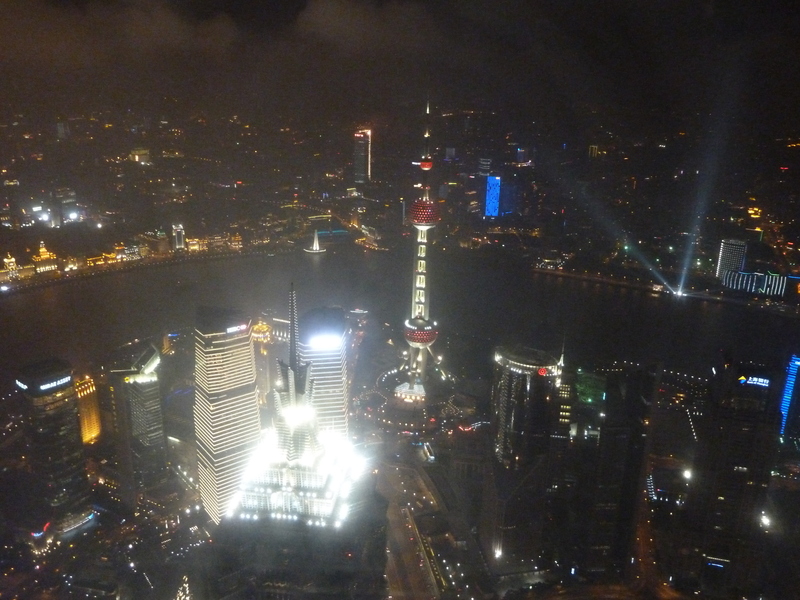 But it meant leaving Shanghai earlier than planned. At least I’ll be able to use the futuristic and exciting Maglev to the airport tomorrow though!